The Bhagavad-Gita is probably the most influential work India has produced. In the form of a dialogue between its hero Arjuna and the avatara Krishna, this Hindu classic is an allegory of Man in his evolutionary development — a searching look at the "field of dharma." 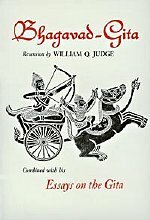 In 1890, responding to many requests for a nonacademic exposition of the Gita, Judge published the present recension, and also wrote several illuminating essays on the Gita. These essays, issued together with his recension, make this volume unique among the many renditions of this ancient classic now available.